Palm Sunday also marks the beginning of Holy Week, a solemn week focusing on the final days of Jesus Christ’s life, cricifica­tion and death on the cross. Whether you are an orphan, without a father or mother or a single par­ent you must believe you are not alone because God already said he would be with you wherever you are. Those were the words of encouragement shared by All Nation Christian Fellowship Church pastor Pita Matakitoga during the Palm Sunday celebration at Kshatriya Hall in Labasa yesterday. 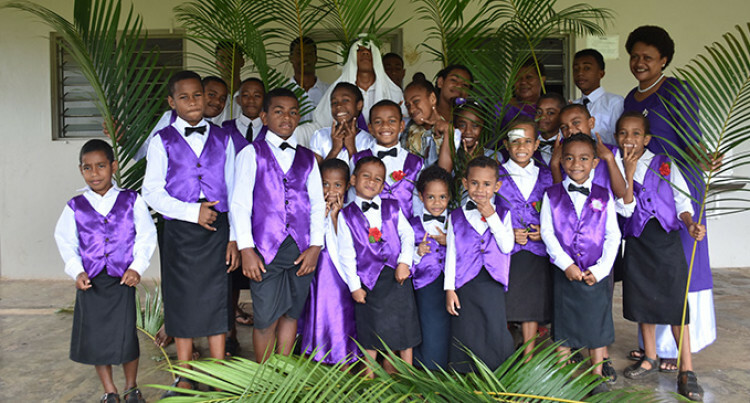 Pastor Matakitoga said the highlight of the celebration was the appearance of more than 30 children gathered waving the palm leaves, singing and dancing. “This event commemorates Jesus Christ’s triumphal entry into Jerusalem, as foretold by the prophet Zechariah,” Pastor Mataki­toga said. “The Bible tells us people cut branches from palm trees, laid them across Jesus’ path and waved them in the air. “They shouted ‘Hosanna in the highest blessed is he who comes in the name of the Lord, even the King of Israel. “Also on Palm Sunday, people remember Jesus Christ’s journey to his sacrificial death on the cross, praise him for the gift of salvation, and look expectantly to his second coming. Holy Week culminates on Easter Sunday.